Sudsy, sopping-wet carpets with that distinct “wet dog smell” — it’s what you get when you use traditional steam cleaner rentals. At KIWI, we use professional dry carpet cleaning to maintain clean carpets throughout our customers’ homes. This process effectively cleans dirt, stains and odors better than steam cleaners. Plus, it won’t create the wet conditions that often lead to mildew or dye migration. Instead, your carpets will dry in just 15 minutes, leaving behind a fresh, clean scent. With 33 years of experience using our dry carpet cleaning method, we know the ins of outs of all kinds of stains and spills. Even high-traffic areas get an instant boost from this effective, deep-cleaning method. You’ll be amazed at how quickly our carpet cleaning services leave behind bright, fresh color where you previously had dullness and stains. Plus, we use an eco-friendly, all-natural cleaning solution that’s safe for pets and kids. Turn to KIWI carpet cleaners to get the fast, affordable results you want for your home. Thousands of homeowners attempt to steam clean their carpets, which can often end in disastrous results. Many of these homeowners are unprepared for the cost and effort involved in moving heavy furniture and hauling heavy equipment to and from the home. Not only can this heavy lifting cause pain and injury, but most of these homeowners do not know that steam cleaning can result in soggy carpets that takes hours, or even days to fully dry. The steam carpet cleaning method attracts even more dust and dirt, creating a vicious cycle of messy cleanings. The professionals at KIWI are here to help. By using the dry carpet cleaning method, KIWI is able to give you the clean, soft carpet you deserve without the hassle and mess of traditional steam cleaning. Here at KIWI Services, we have 33 years of carpet cleaning experience and provide customized carpet cleaning for each home. Our service teams evaluate each carpet for fiber content followed by an analysis of soiled areas prior to any cleaning. Each carpet in your home contains unique fibers and dyes that can be ruined by improper cleaning techniques. Although some manufacturers suggest renting a steam cleaner, many suggest the help of professionals in order to maintain the integrity and value of a carpet without voiding warranties. After we analyze the unique needs of your carpet, we mist your carpet with our pH balanced cleaner and use specially designed drying bonnets to loosen soil particles and transfer the dirt off of your carpet. Because we use no water in our cleaning, drying time is reduced to as little as 15 minutes, providing you with a fresh, clean carpet without the long drying time of steam cleaners. We also provide all the preparation prior to a carpet cleaning, including vacuuming and moving furniture. Our citrus cleaner uses no heat and no hot water so there is no threat to the delicate fibers and dyes in your rugs and carpets. We believe in preserving the value and integrity of every beautiful floor and provide you with only the best in dry carpet cleaning. 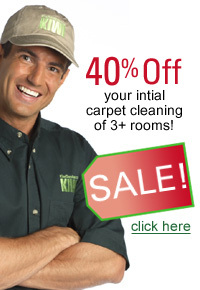 For Quick- Dry Carpet Cleaning Services, Call Kiwi!